Super Hero and I received Visual Latin 1 from Roman Roads Media for free, in exchange for my thorough and objective review. 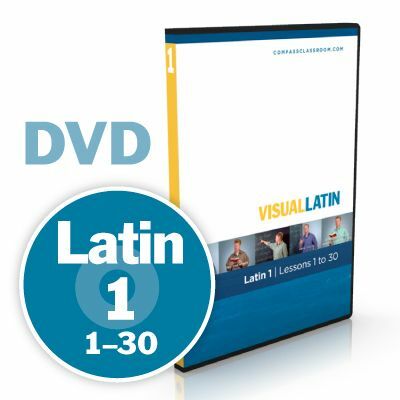 Visual Latin 1 & 2 is a complete Latin homeschool curriculum intended for children ages 10 and up. This package makes for quite a heavy file, or rather a collection of files. One must click on the individual lessons and download them one by one. I would have preferred to have had to click on only one or two links. However, I do understand that would have made for an impossibly large file –after all these are videos we’re talking about, so yes, the downloading takes a little bit of time to do. Visual Latin’s presentation is very professional. There’s always an introduction with a nice, catchy jingle and screen effects. The quality of the video and audio is excellent. And there are useful bold annotations and visual cues throughout the lesson right when they’re needed. Super Hero and I have been watching the videos and enjoying them very much. We watch the videos together and then Super Hero will do the worksheets to review and practice what we’ve learned. We usually do the worksheets together too, although I let him say the answer aloud before he or I write it down. Dwane Thomas, the instructor, makes each video lesson short (around 5 minutes), easy-to-follow, and most important of all –from a kid’s point of view, anyway– full of good, sparkling humor! Each video is to be followed by the worksheet, which we don’t print anymore. We use the super duper Notability app, and thus complete the whole thing on the iPad. There are also quizzes, vocabulary lists and online flashcards that support each of the lessons. During the reading video (the C video), Dwane will read a portion of the Old Testament by himself in a very clear and steady pace. Then he will read it a second time, pausing to allow us to repeat after him. His method succeeds in getting us to read fairly long paragraphs very quickly. And since each lesson builds on the one before it, readings have only become longer and more complex. Isn’t it very satisfying to be able to understand when you read in a foreign language? Especially if it’s rather quickly? I sure love this aspect about Visual Latin! I had two concerns before deciding to try Visual Latin. First, that it wasn’t a secular curriculum, and second, that it was aimed for children ages 10 and up. Well, as it turns out, both of these concerns have dissipated. I haven’t found the religious content in Visual Latin to be indoctrinating, and I appreciate that very much. In fact, we are using Dwane’s readings of the Old Testament as a way for Super Hero to learn more about the Christian religion. Therefore, Visual Latin is helping Super Hero to fulfill two learning purposes: Latin and Christianity’s Creationist beliefs. Although Super Hero’s still 8, I felt encouraged to give it a try since he’s been studying Latin for over a year. I’m very glad we did try Visual Latin 1! So far, it’s been such an enjoyable experience for both of us. We’ve watched the videos together for the most part (sometimes I will ask him to go ahead and watch something without me), and he’s been able to follow along just fine. As far as the worksheets, I do modify a little bit, just because there’s quite a bit of writing for an 8-year old who’s still learning to like writing better. 😉 I will sometimes allow him to dictate to me, or to do some or all of the translations orally. Super Hero gets a kick out of Dwane’s jokes, and I do too! He says a joke and pretends he continues to explain some concept or that’s something serious. Real funny! For example, in the introductory video, he shares all the goals he wishes students accomplish by the end of the course. –”And the last goal is”, he says –”to prove Augustus Caesar wrong. Augustus Caesar said”, then reaching around to get a little notebook from his back pocket, he begins to read intently as if he doesn’t want to miss any part of what Caesar had said. –”There is no way the Latin language can be learned by DVD or digital download. I mean, c’mon! What’s an iPad or an iPod or a smart phone?” He closes his little book, looks up, and adds in a most serious tone –”You know what? He was wrong, and it’s time to prove him wrong!”. Hilarious! Talk about capturing a child’s –or an adult’s– attention! Yes I would recommend Visual Latin 1. It’s been an effective and enjoyable way to learn Latin. I totally appreciate Dwane’s amusing style and ability to impart his knowledge of a topic that could be rather dry. We will definitely use all 30 lessons in Visual Latin 1, before we move onto Visual Latin 2. Roman Roads Media does offer a free trial of Visual Latin 1’s first 5 lessons if you’d like to give this fun Latin curriculum a try.